previously unpublished letters and journals from the Waterloo Campaign. Readers of the previous four volumes of the Waterloo Archive will already be aware of the reasons why I have embarked upon this crusade to bring into the public domain such a mass of new material relating to the Waterloo campaign and the subsequent Occupation of France by the allied forces from 1815-18; however a short recap for new readers will not go amiss. A huge amount of material has been written regarding the Waterloo campaign, perhaps more than any other campaign before or since, so what can possibly be new, and is there anything more to learn? Having spent years surveying the existing material published over the last nearly two hundred years, the answer will perhaps be surprising to many, a resounding yes. In the previous volumes, I have explored the archives of Britain and those of our ex colonial brothers where much material including art works which have never previously been published were discovered, including some astonishing finds of truly historical significance and I will return to this treasure trove in the final Volume Six in due course. But what of Volume Five? This time I return to the German troops, who actually formed the majority of the forces present at the Battle of Waterloo including the troops of Nassau, a small German state, some of whose troops actually served in the Dutch Army at the battle. Some record of the actions of the troops of the King’s German Legion, which was considered as an integral part of the British Army and thus partly officered by British citizens, has therefore been published in English, but to a very limited degree. However this tiny portion of German material has been virtually all that has been available to students of this campaign who did not possess a high level of German language skills until very recently and it is therefore not very surprising that early British histories of the battle have largely sidelined the achievements of the German troops and this stance has been regurgitated by most that have followed. This situation did not change at all until the 1990’s when Peter Hofschroer published his two volume version of the campaign from the German perspective, which included numerous snippets of various German documents published for the first time in English to support his view of the campaign; but even this is not satisfactory as it left much more still to be translated and published and did not provide the whole documents to allow further interpretation. There is therefore, still a great need to provide an English version of much of the original German source material to aid historians redress this imbalance. Such a task is truly daunting, not just because of the scale of the task, but also the inordinate amount of time needed by a translator with the appropriate level of language skills and grasp of military history and terminology to produce a coherent, meaningful translation. I made a small venture into this area when I published ‘Letters from the Battle of Waterloo’ in 2004, when publishing the remaining Siborne letters, having cause to obtain translations of the numerous German letters in the files. I experimented with various means but all had their problems; professional translators proved extortionately expensive; charitable organisations which one still felt honour bound to recompense or friends and acquaintances who required no fee but forced me to accept interminable delays were all unsatisfactory. I was therefore perhaps understandably not very keen to venture into translation work again. That is, until I had the luck to begin a correspondence with Martin Mittelacher, who is of German extraction, living in retirement in the United States of America and an expert on the Waterloocampaign. He had previously liaised with Peter Hofschroer on his translation work which also gave me great confidence in his abilities. Having had the audacity to ask him if he would consider translating the vast amount of German material that I was able to obtain from obscure sources and explaining the project, I was overjoyed to hear of his acceptance. Since then Martin has worked tirelessly and diligently to translate all of this material and our combined expertise has been utilised to edit the material and provide learned footnotes. Much of Volume II was derived from Belle-Alliance, Reports and Information on the Participation of German Troops of Wellington’s Army in the Action at Quatre Bras and in the Battle of Belle-Alliance by Dr. Julius von Pflugk-Harttung, Privy Archive Councillor at the State Archive in Berlin, published in German in 1915. This book is a veritable gold mine of primary source material from German units. It is truly amazing and a great loss to many historians that it has never previously been published to any great extent in the English language. Some further material from this source is now printed in Volume V, but does not this time form the majority of the book. Again, it is not intended to merely form a translation of Pflugk-Harttung’s book and is not published here in exactly the same format. Pflugk-Harttung broke up the reports into sections of his work covering Quatre Bras, the Retreat and the Battle of Waterloo [Belle Alliance]. For ease of use I have joined these various portions back together to form one coherent report, but have clearly annotated each with the numbers of the letters they come from in his work. 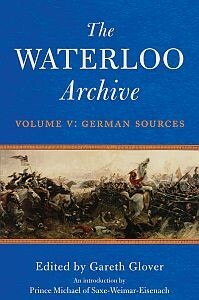 The material has been set out in a very similar format to Siborne’s Waterloo Letters and the editor’s Letters from the Battle of Waterloo, for ease of use and all cross references are annotated in the notes virtually making all of these works one huge reference source on the Waterloo campaign. But beyond Harttung; there are many German memoirs of the Waterloo campaign, which have been published in Germany over the last two centuries, but are very rare in German and have never been published in English before and therefore have never been quoted in English histories of this campaign. The other joy that these memoirs bring; is that unlike the dry, staid and matter-of-fact reports that dominate Harttung’s work; these German memoirs equal their British counterparts for grit, earthy humour and daring-do. Now it is truly possible to experience the life of a German soldier during the interminable marches in both blazing sun and torrential rain; with little if any food and water; little rest or dry clothes and yet still able to perform with professionalism and unquestioned bravery for all those interminable hours of dreadful battle that they endured. Bremen and Verden Hussars stationed at Halle during the Battle of Waterlo; the memoirs of Henry Dehnel 3rd Line Battalion K.G.L. describe in graphic detail how he managed to endure the constant cavalry attacks upon the squares on the ridge that day. Ensign Uslar-Gleichen 4th Line Battalion K.G.L. vividly describes the intense fighting in the orchard of Hougoumont; Lieutenant von Brandis, aide de camp to Colonel Ompteda was fully involved in the fatal advance in which Colonel Ompteda and his battalion were unnecessarily sacrificed and Lieutenant Biedermann of the 2nd Light Battalion K.G.L. is another invaluable eye witness to the heroic defence of La Haye Sainte. But many other German contingents also fought that day and in this volume there are a number of accounts from officers with the Hanoverian Landwehr Battalions: Lieutenant Bulow of the Bremen Field Battalion & Lieutenant Hemmelmann and Private Schacht of the Gifhorn Landwehr give fascinating glimpses of the militia units present and who also fought with bravery and tenacity in both the Battles of Quatre Bras and Waterloo; Lieutenant von Horst of the Verden Landwehr gives a vivid and fascinating account of numerous incidents during his capture at Quatre Bras, his subsequent treatment by the French and his eye-witness account of a fleeing Napoleon! Then of course, there were the Nassau troops; these troops are represented here by: General Kruse’ report giving much detail on the actions of the Nassau troops and further fascinating material regarding disputed versions of events, such as Prince Bernard of Saxe Weimar’s letter claiming that the Nassau troops were routed in the Papelotte area and the subsequent vehement rebuttal by his own officers. But once again the memoirs of Private Henniger 1st Nassau Regiment prove even more fascinating, as he relates the destruction of part of his regiment by cuirassiers during an ill advised charge on some French artillery. Captain Wirths memoirs, of the 2nd Battalion 2nd Nassau Regiment form another very important witness to the defence of La Haye farm in the Papelotte area. But perhaps most significant of all, is that of Sergeant Buschieb of the 1st Battalion 2nd Nassau infantry who was fully involved in the defence of Hougoumont and who backs the theory that there were TWO nearly successful break-ins at Hougoumont. And finally but not least there is a truly fascinating report by General Herzberg actions of the Brunswick contingent which is incredibly informative and detailed on every aspect of the involvement of this corps during this campaign; even down to the colour of the horses of each senior officer! surgeons during the Battle of Waterloo and their subsequent court martials. 6.A list of all Nassau officers at Waterloo. These German reports and memoirs are very often much more frank and open with regard to their failings; honestly describing mistakes or errors of deployment that led to losses and even naming and shaming both officers and men who failed to perform their duties, something that must have happened in every unit involved in such carnage, however such honesty is virtually unknown within contemporary British accounts. I am therefore very proud to present this second volume of German primary source material of which only small parts have ever to my knowledge been published in the English language before, for both the use of eminent historians and those who are simply interested in gaining a greater understanding of that whirlwind campaign which occurred nearly two hundred years ago.